The island Lido di Venezia is directly opposite the old town of Venice and a district of Venice. In strong contrast to Venice itself, Lido di Venezia is a modern island. Many people live here in normal apartments and detached houses. There are also many hotels, restaurants and other facilities for tourists. There are rather few old buildings worth seeing in the modern Lido. Nevertheless, there are some things you should have a look at. Below are some interesting attractions and sights on the island of Lido. The most important attraction, because of the beach many tourists come to Lido. 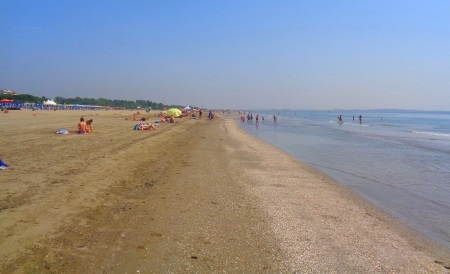 The Lido beach is more than 10 kilometers long and consists to a large extent of fine, gold-colored sand. The beach is certainly the most visited attraction on Lido..
Malamocco is the most beautiful village in the south of the island. 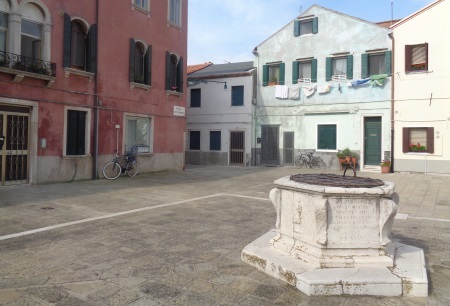 From our point of view, the old town centre is the most beautiful sight on the island of Lido near Venice. The Venice Film Festival has existed since 1932 and is one of the three largest film festivals in Europe (alongside Cannes in France and Berlinale in Berlin). The Venice Film Festival is held on the island of Lido from the end of August to the beginning of September each year (2019: 28th August to 7th September). The highest award is the Golden Lion. 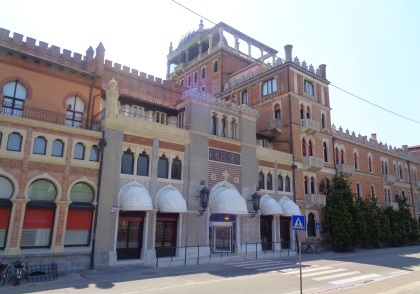 All year round you can watch the famous Palazzo del Cinema on Lido. The attraction is in the city on the Adriatic side, about one km on foot from the ferry port. In Italian the great building is called "palazzo del cinema", the film festival is called "Mostra internazionale d'arte cinematografica di Venezia". Among the most important sights on the island of Lido di Venezia are 2 to 3 hotels. Almost next to the above mentioned film palace is the elegant Hotel Excelsior, for us the most beautiful building on the island. From the street, one also sees the own big boat parking lot of the Hotel Excelsior. Hotel guests are comfortably transported from here for example to the airport or to Venice. 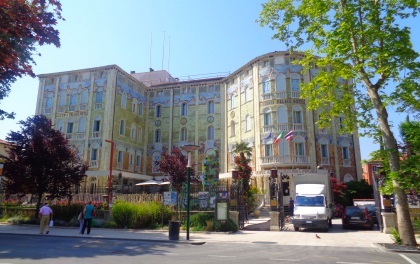 Another famous sight in the form of a hotel is the Grande Albergo Ausonia & Hungaria. It is only a few hundred meters away from the central ferry port "Santa Maria Elisabetta" (water buses to and from Venice). The hotel also has a luxurious restaurant with the best reputation. There are several other traditional, noble hotels on Lido. There are few other sights on the island of Lido itself. Most guests come to Lido to spend the night. They come because of the beach or to make day trips to Venice. The old town of Venice is only 15 to 20 minutes away from Lido by public waterbus. From nowhere else you can get to San Marco, the tourist highlight of Venice, faster and easier than from Lido.